Remaking beloved properties in different mediums, from the mash-up of two shows on a t-shirt to 250 fans reinterpreting an episode of Sailor Moon, is a large part of fan culture these day. Creative fans express their love of something by filtering it through their love of something else, and the results can be an excellent testimony to both. And some of the biggest creative fandoms (outside of Community) are those dedicated to animated shows like My Little Pony, Adventure Time, and Gravity Falls. Gravity Falls, for those not in the know, is a Disney cartoon about twin siblings Mabel and Dipper Pines spending a summer with their Great Uncle Stan in the titular town. With its cast of eccentric townsfolk and ongoing mysteries, the show is like a cross-pollination between early seasons of The Simpsons and the good episodes of Twin Peaks. 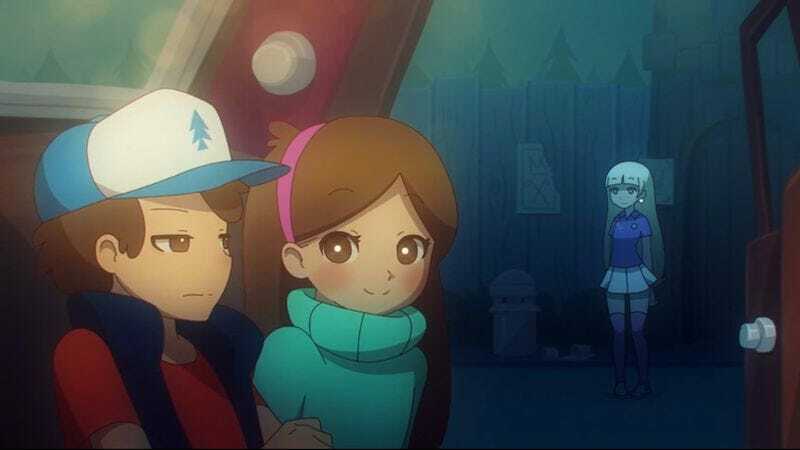 Mike Inel, an anime digital artist, recently applied his skill set to translating a scene from Gravity Falls into the style of anime. (The show dipped its toes into anime style with the Japanese-influenced character Giffany in “Soos and the Real Girl,” but that was a guest character, not a reinterpretation of the Pines children.) By using the standard artistic styles of anime, Inel makes the scene a bit more contemplative than its original, but he maintains the fun and sweetness of the show. Taken from the episode “Golf War,” Mabel offers a ride to her nemesis Pacifica Northwest, a snooty rich girl, and teaches her about the joys of eating tacos in a car. (Here’s the original scene for comparison.) Inel didn’t include Soos or Grunkle Stan beyond their ears and voices, which is unfortunate because it would’ve been pretty interesting to see anime versions of their characters. But it’s still impressive work which shows what can be gained (or lost) by using a different aesthetic approach.